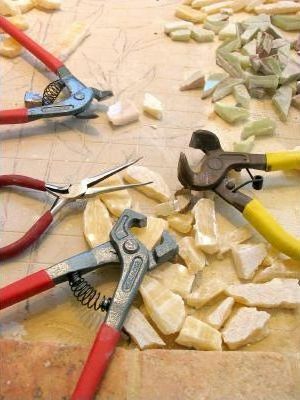 There are many different mosaic tools and accessories you will need to make your mosaics; some are more essential and some you can do without if you improvise. Here is a list of the tools and accessories you will need to make your life easier! Keep in mind that this list is a list of tools needed to make your mosaic, not what is needed to install it. This will be covered in the Installation and Care section. Safety equipement is also a must, broken ceramic is very sharp! As you get to know and love mosaic art, you will want to get these as well.